$300 Instant Savings. Expires May 9, 2019. * All prices reflect savings. 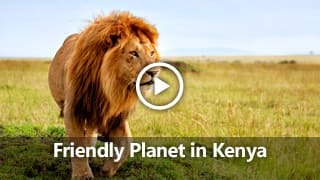 Highlights Daphne Sheldrick Elephant Orphans' Nursery, Karen Blixen Museum, Langata Giraffe Center, Lake Naivasha Boat Safari, Masai Mara Game Reserve. What to Expect This fast-paced, partially escorted tour includes a reasonable amount of walking or hiking and requires an average level of physical fitness. This tour also includes long scenic drives between destinations, sometimes on bumpy unpaved roads and may have limited rest stops. Who wouldn't include Kenya on their "bucket list" of places to see? 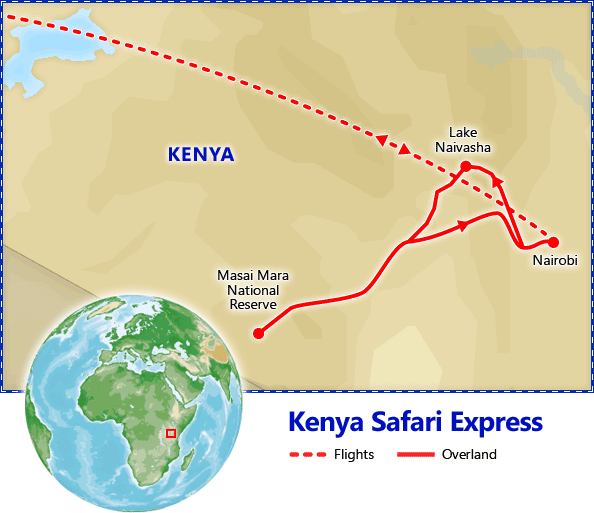 Our 8-day Kenya Safari Express is one you won't want to miss! Our package includes airfare, transfers, great hotel & lodge accommodations, daily buffet breakfast, lunches & dinners on safari, and plenty of touring. You'll see orphan elephants at Daphne Sheldrick's Elephant Nursery, embark on a thrilling boat safari on Lake Naivasha, experience amazing game drives in the Masai Mara National Reserve and much more! And as always, in true Friendly Planet style, we've managed to package a dream vacation at a price that is unbelievable, even to us. See our detailed itinerary below for day-by-day descriptions. Instant Savings: Get $300 off if you book by May 9, 2019! Accommodations: 1 night InterContinental Nairobi. Upon arrival in Nairobi, following customs and immigration formalities, meet our representative and transfer to your hotel. Accommodations: 2 nights Naivasha Sopa Lodge. Included meals: Breakfast, lunch & dinner. Full Day Itinerary: After breakfast and check-out, visit the Daphne Sheldrick Elephant Orphans' Nursery, where young orphaned elephant babies are hand-raised until they are released back to the natural habitat in the Tsavo National Park. Here they are able to mingle freely with the wild community. Next, depart Nairobi travelling west through Kenya's fertile farmlands and into the Great Rift Valley. Arrive at your lodge, set amidst acacia trees, overlooking Lake Naivasha. After lunch, check in and spend the remainder of the day at leisure. Tonight, enjoy dinner at the lodge. Full Day Itinerary: After Breakfast, discover Hell's Gate National Park, named for the intense geothermal activity within its boundaries. It is a remarkable quarter of the Great Rift Valley. Spectacular scenery including the towering cliffs, water-gouged gorges, stark rock towers, scrub clad volcanoes and belching plumes of geothermal steam make it one of the most atmospheric Parks in Africa. You may see African buffalo, zebra, eland, hartebeest, Thomson's gazelle, baboons, klipspringer antelope and Chandler’s mountain reedbuck. Return to lodge for lunch. In the afternoon, embark on a safari boat ride on Lake Naivasha. Accommodations: 2 nights Keekorok Lodge. Included meals: Breakfast, lunch & dinner. 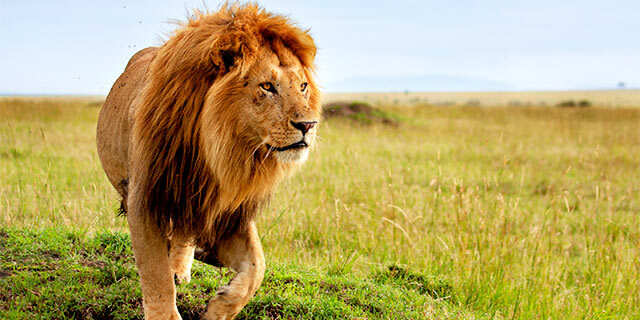 Full Day Itinerary: After breakfast, depart for the Masai Mara. This park offers wonderful scenery and plenty of game viewing. It is perhaps the only region remaining in Kenya where the visitor can see animals in the same abundance and variety as existed a century ago. Here among the grassy plains and lush landscape, you'll find lions, cheetahs, buffalo and abundant bird life such as ostriches, cranes and storks. 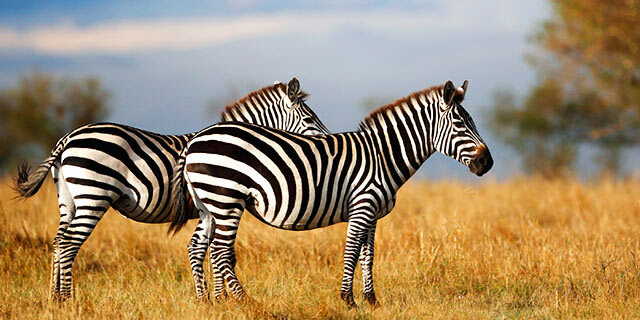 Every year, between June and September, millions of wildebeests and zebras migrate into the Mara in search of water. The timing of this phenomenon varies, depending on the rains, but they usually start heading back to the Serengeti in October. Whether you see the migration or not, the Mara almost guarantees you'll enjoy a magnificent time in Kenya. Enjoy lunch at your lodge then relax until later this afternoon when you'll take your first game drive through this haven of wildlife, lasting until sunset. Full Day Itinerary: Continue your discovery of the many species of wildlife in the park today on two game drives, one this morning and another later in the afternoon. You have the option of replacing the morning drive with an optional balloon safari, which provides a thrilling opportunity to soar high over the plain for animal viewing from above. Whether you go by air or land, you will enjoy searching for animals native to this fascinating and beautiful area guided by your expert driver, who will amaze you with his ability to spot game hidden in the bush. You may see a variety of antelope, including wildebeest, and Thomsons & Grant gazelles. 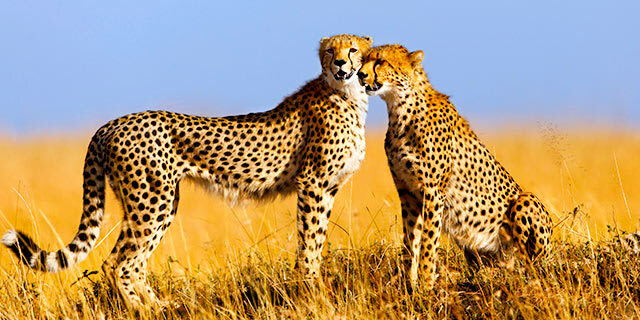 The "Big Five" are all found in the Masai Mara, as well as cheetahs and bat-eared foxes and many other varieties of wildlife. After lunch, enjoy some leisure time at the lodge, including a refreshing swim in the pool. 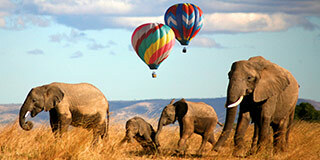 Optional Excursion: Masai Mara Hot Air Balloon Safari & Champagne Breakfast, $450 (purchased locally). 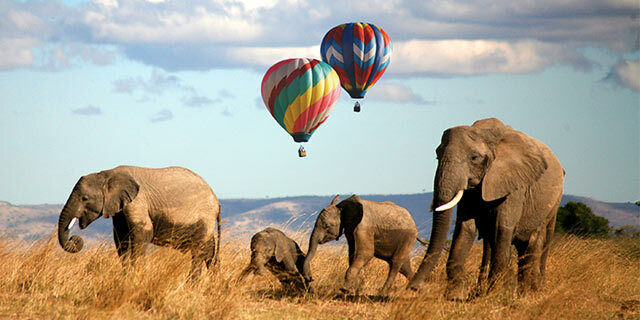 Enjoy a once-in-a-lifetime opportunity to take a balloon ride across the Masai Mara. Weather conditions permitting, your flight begins in the pre-dawn hours, when the view over the park is most magnificent. Toward the end of your adventure, you'll rise to a height of 1,500 feet for a panoramic view of the twisting Mara River and the savannah below. After an hour or so in the air, your safari finishes with a champagne breakfast in the bush, cooked on the balloon's burners. Flight may not operate if weather conditions are not suitable. Optional Excursion: Masai Village Tour, $25 (purchased locally). This afternoon, you can get an in-depth look at this colorful and pastoral people in their natural setting. Experience what the Masai tribal life is like as you walk through a traditional village compound. You'll be greeted by the village chief and be escorted around the village by a local host who will explain the history, culture and practices of the Masai. Before departing the village, enjoy a cultural performance by the young men of the tribe, the famed warrior "morans". Credit cards not accepted for this excursion. Accommodations: Crowne Plaza Nairobi Airport or similar (day-use room). Included meals: Breakfast & dinner (or lunch). 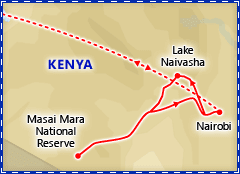 Full Day Itinerary: After breakfast, depart the Masai Mara for Nairobi. Upon arrival, enjoy an "all you can eat" farewell lunch at the famous Carnivore Restaurant. After your meal, proceed for a visit to the Karen Blixen Museum. Before becoming a museum in 1991, the house and surrounding 4500 acre farm were owned by "Out of Africa" author Karen Blixen from 1917 till 1931. Continue to the Kazuri Bead Factory Store, where the guide will explain the hand-making process. Kazuri, which means "small and beautiful" in Swahili, began in 1975 as a tiny workshop experimenting in making handmade beads. The factory is located on part of the former Blixen estate. Its founder, Lady Susan Wood, started with two Kenyan women and soon discovered that there were many other women in the villages around Nairobi, most of them single mothers, who were in great need of regular employment. Later, visit The Langata Giraffe Center, established to protect the endangered Rothschild's giraffe. There are also several warthogs which roam freely with the giraffes. Guests may feed the giraffes from a raised feeding platform. Then transfer to your day-use room to relax and freshen up. Bid farewell to Kenya as you transfer to the airport for your return flight. Crowne Plaza Nairobi Airport is the only official hotel located at the Jomo Kenyatta International Airport, designed to offer a luxurious and elegant experience with unmatched security within the most protected zone in Nairobi. With its convenient location, less than 3 minutes from the terminals, the hotel caters to transiting passengers adding tranquility and comfort to their travel experience.Designed with the world traveler in mind, all of Crowne Plaza Nairobi Airport’s 144 guest rooms have contemporary chic designs, plus interiors and amenities that exude luxury and comfort. These spacious units take you to a world of regal splendor with lavish furnishings, unique lighting fixtures and indulgent amenities, for a warm and relaxed feel. Standard features include air conditioning , tea/coffee maker, minibar, safe, telephone, hairdryer, alarm clock, bathrobes, slippers, complimentary toiletries, and flat-screen TV with international cable channels. The five star Intercontinental Hotel Nairobi resides in the center of downtown Nairobi, nearby the main International airport.The hotel is conveniently located under a mile from attractions such as the National Assembly Builing, the Kenyatta Mausoleum, Central Park, and the Times Tower. The Intercontinental's 385 rooms feature cable/satellite TV, in-room movies, mini bar, safety deposit box, work desk with lamp, internet connection, and individually controlled air-conditioning. The hotel is home to 2 restaurants, 1 bar, a fitness center, a spa, a casino, an outoor pool, and a 24-hour business center. Amid the vast sweeping savanna plains stands Keekorok Lodge, Masai Mara's first game lodge. Against the backdrop of Kenya's most magnificent scenery, the lodge offers a unique and luxurious safari experience, blending contemporary African style with the magic and charm of the region. Enjoy the sunset as you watch hippos, birds and other animals from the walkway, all without even leaving the lodge.Keekorok's open-sided dining room provides stunning views of the surrounding landscape and serves traditional African, Asian and Western cuisine. The bar offers a wide variety of whiskies, cigars and freshly ground Kenyan coffee.After a day of game-spotting, take a dip in the outdoor swimming swimming pool or relax in one of the lounge chairs. The lodge also has a gift shop that stocks every conceivable item for a comfortable safari as well as hand-crafted gifts, paintings and sculptures. Lake Naivasha Sopa Lodge is situated on 120 acres of prime land. The construction of the lodge features 3 fireplaces with huge inverted copper funnel shaped chimneys, a high roof with glass panels which open out to a small terrace with beautifully manicured grass and colorful flowers, wrought iron chandeliers, and walls decorated with intricately carved wooden panels. The Lake Naivasha Sopa Lodge has 21 cottages built in a crescent shape comprising of 84 rooms total. The pathways from reception to the rooms are lined with various kinds of plants and colorful flowers. Little rock gardens are also found along these paths creating a beautiful contrast with the greenery of the well manicured lawns. Several species including Colobus monkeys are often spotted playfully rolling on the lawns. I'm traveling solo. Can you help me find a roommate? Unfortunately, we can't pair you with a roommate on this package. Should I purchase travel protection? Yes! You can purchase our travel protection plan with your deposit or final payment. It may not be purchased before then. What should I know about Kenya? Check out our guide for travel tips, the best time to go, blog posts, videos, and more.